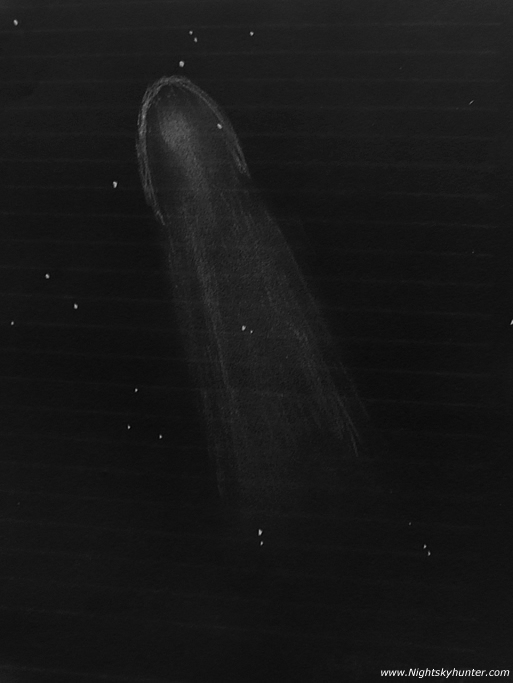 17P/ Holmes sketch made on the evening of Dec 10th 2007 when the comet was well placed in the high NE sky within the heart of Perseus. This was the view in my 10x50mm Bresser binos showing the large parabolic shaped coma and wide dust tail several degrees to the south of the coma with narrow straight tail or spine superimposed on top. This sketch is VERY rough. The sunward end of the coma is too bullet-shaped however it does represent the general appearance of the comet from dark skies. This was a very difficult sketch to do as I had to memorize a small segment of the comet at any one time, set the binos down, turn on my red torch then record this in my note book then the repeat the procedure many times!. Holmes is a beautiful comet!